Historical Buildings hold a mystery when you try to imagine the vibrant life that filled them in the days of our ancestors. In 1873, the building that has been the Freemason Abbey Restaurant for 20 years was opened as a Second Presbyterian Church. One can only visualize pews filled with ladies in their fancy dresses, choir sounds reverberating off the cathedral ceiling, and the sun shining through colorful stained glass windows. What a beautiful church it must have been! Twenty-nine years later, in 1902, we know that the congregation sold the property to the First Church of Christ Scientist. The building continued to be a place for gathership and worship until 1948. At that time the building was transformed to a meeting hall for the Independent Order of Odd Fellows. We have one picture in a photo album at the host desk that shows a small wall-paneled room with acoustical ceilings and no windows. When the owner, Jerry Collier, considered the building as a restaurant in 1987 it was a dilapidated structure in need of much repair. He saw potential in the old building and had a vision of a restaurant in the former church setting. The vision was inspired by a visit to a restaurant in Atlanta, Georgia called The Abbey. This vision was transformed into reality and once again the building felt new, exciting, and full of life as a meeting place for all to enjoy. How appropriate that many couples become engaged over dinner or celebrate a rehearsal dinner in the “former” church. 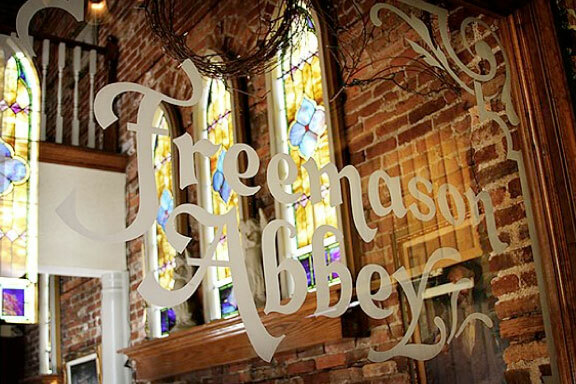 As Freemason Abbey Restaurant celebrates its 21st anniversary, the building celebrates 138 years. We do not have any picture of how the building looked inside when it was a church from 1873 to 1948. We wonder how many couples were married here. Perhaps one day a guest will tell us “my parents or grandparents were married in this building and I have a picture of them here.” Until then we can only imagine….